Ok, if you’re leaning anywhere in the vicinity of a grand gesture this year, first and foremost, allow me to suggest this 6 pound, heart shaped box of handmade chocolates. 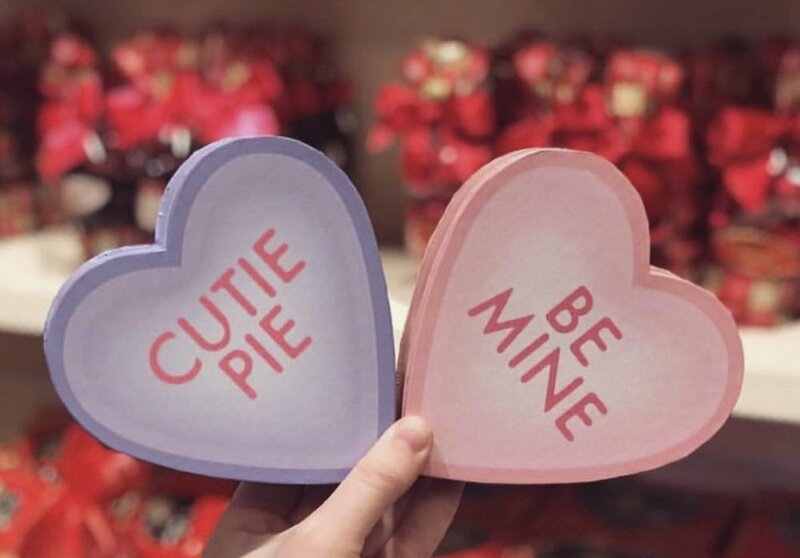 Make Feb. 14th sweeter and much more Insta-worthy (let’s not kid ourselves, absolutely everyone’s taking photos specifically for IG these days, from your mom who only just got a smart phone two years ago to your next door neighbor who clearly could use a tutorial in photo editing apps) for your favorite person. Ideal for your mom or the aspiring Insta blogger in your life (news flash, we all have one). Or both. Or if you’re stuck on the idea of those conversation hearts (I don’t know one person IRL who counts them as their go-to candy during Valentine’s, but whatevs), Sweenor’s has an homage to those with their updated clasic and yummy spin -these mini boxes of candy that are completely adorable. Not to mention filled with delicious locally made treats. The perfect sweet add-on (to maybe some bling from Providence Diamond, only a few doors down from Sweenor’s GCC location…) for your sweetie. Also, once again this year, if you’re lucky enough to be in the vicinity of their Wakefield location this Feb. 14th, they’ll have some of their famous hand-dipped chocolate strawberries available. For you or as a last minute present for someone special on your list.